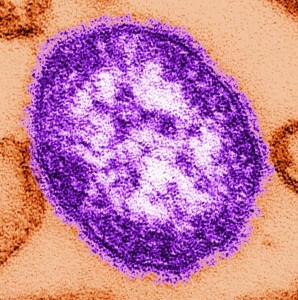 Olivia, my eldest daughter, caught measles when she was seven years old. As the illness took its usual course I can remember reading to her often in bed and not feeling particularly alarmed about it. Then one morning, when she was well on the road to recovery, I was sitting on her bed showing her how to fashion little animals out of coloured pipe-cleaners, and when it came to her turn to make one herself, I noticed that her fingers and her mind were not working together and she couldn’t do anything. Incidentally, I dedicated two of my books to Olivia, the first was ‘James and the Giant Peach’. That was when she was still alive. The second was ‘The BFG’, dedicated to her memory after she had died from measles. You will see her name at the beginning of each of these books. And I know how happy she would be if only she could know that her death had helped to save a good deal of illness and death among other children.